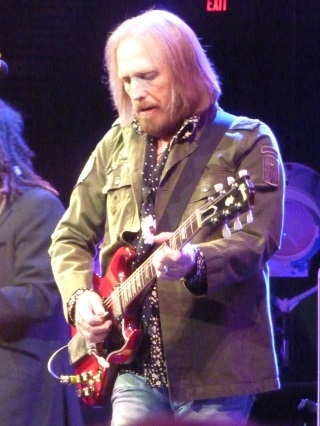 Tom Petty is probably the only rocker who plays so hard yet seemingly so relaxed. That almost carefree style to playing led to a stellar set on Tuesday as Tom Petty and the Heartbreakers nailed down all the radio staples and a few off their latest album Hypnotic Eye for the aforementioned named tour that hit the Moda Center in Portland, OR. It wasn’t a sold-out crowd as the 300 level seats were curtained off giving those ticket buyers perhaps a nice surprise to move even closer to the stage. But the raucous crowd that maxed out the floor and lower section received a 20-song two hour set of pure rock from one of the most beloved musicians of all-time. Looking more like a lumberjack with jeans, boots and a military style overcoat, Petty brings a subtle but almost imposing stage presence that fit him well as he worked his way through iconic hit after iconic hit. 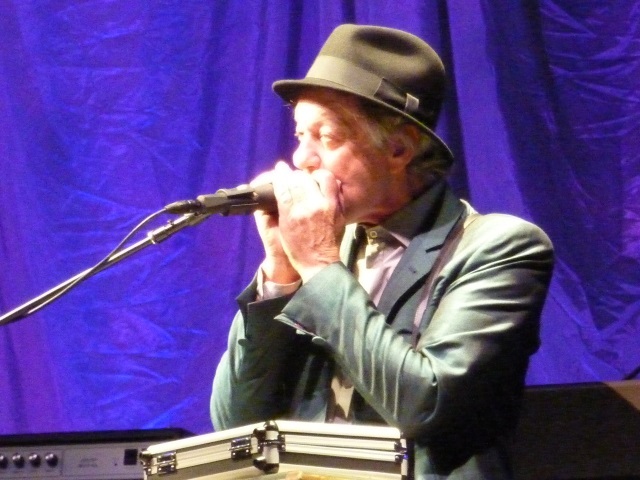 His downright casual approach to playing is, well, not really that once guitar chords, drums and his southern drawl fills the arena. Petty opened the evening with the cover song “So You Want to be a Rock and Roll Star” and then those-oh-so familiar opening guitar chords to “Mary Jane’s Last Dance.” Another cover song “Baby, Please Don’t Go” which showed a bit of Petty’s comical side was next before the Heartbreakers punched into the first song and opening track off the new album “American Dream Plan B” which in many respects surpassed the album version. It’s understandable, perhaps, that Petty gives an ode to an artist that helped shape his music career or someone he respects, however, someone with his catalog should forego the cover songs for either deeper album cuts or those fan favorites left off the setlist. Beggars can’t be choosers as the always fantastic “Into the Great Wide Open” followed then lead guitarist Mike Campbell, whom Petty said “The guy who makes us who we are” shined on “Forgotten Man” one of the great straight-forward rock songs off Hypnotic Eye. All told Petty played just four songs off the new album which only has two duds -“Full Grown Boy” and “Sins of my Youth” – but an absolute gem in “Red River” which sadly got left off the setlist. While Hypnotic Eye certainly lives up to the near hyperventilating hype some in the music industry gave it proclaiming Petty’s returned to form – as if his debut album and 1979’s Damn the Torpedoes is all that defines him – Hypnotic Eye, Petty’s first No. 1 album, isn’t really a return to roots or whatever that means. It’s classic Tom Petty. Maybe that’s why he feels like a forgotten man. Petty also featured four songs from his first solo album Full Moon Fever starting with “I Won’t Back Down” and one of many audience favorites “Free Fallin’.” His side project with the Traveling Wilburys also got a nod with “Tweet and the Monkey Man” a meandering tune full of enjoyable melody. 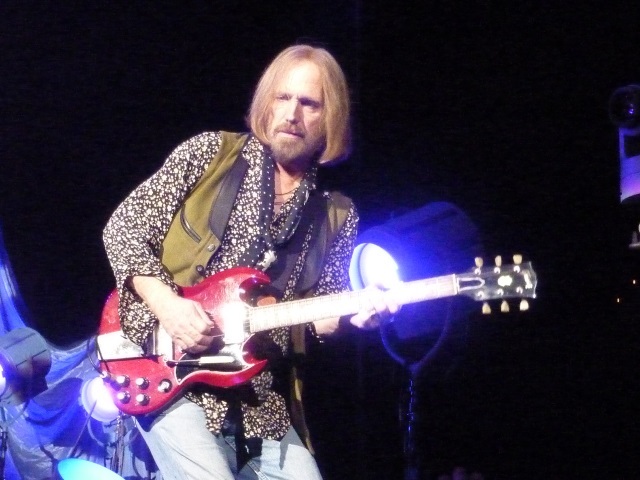 Petty does not bring glitz and glamour to his stage show. In fact, save for the full accompaniment of musicians and their respected instruments, it was for the most part quite lean and absent the usual lasers, fog machines and staggering array of lights that often accompany rock performances. Even the back ground curtain which did not show any such video until nearly an hour into the show was lazily hung as if it was waiting to drop and unveil a dramatic backstop. But this is Tom Petty. The music stands on its own. Despite that, the band campfired it out bringing in the acoustics midway through the set starting with “U Get Me High,” off the latest album, the beautiful “Rebels,” then “Dogs on the Run,” the great “Yer So Bad” and finally “Learning to Fly” where yes even Mr. Tom Petty is allowed to make a mistake when a miscommunication with the Heartbreakers stopped him cold. But in true Petty form, he laughed it off as did the rest of the crowd, started over and delivered a softer version of the song while keeping its integrity. As long as Tom Petty and the Heartbreakers continue to tour, indeed rock and roll is still alive.